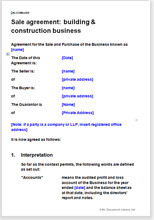 This is a comprehensive agreement for the purchase/sale of a business by an individual, a company or any other organisation. Complications arise if the purchase money is not paid over to the seller at the same moment as other matters are finalised. This and other Net Lawman documents assume that most matters will be completed when the cash is paid. There are a few inevitable exceptions, particularly when relying on a third party such as a web host or domain name registrar. If it is inevitable that some matters remain to be done later than the date of completion, you should use our drafting service to draw the fine points for you.